In the 17th century powerful merchants struggle become the most successful trader in the city of Amsterdam. Each player follows his own special plans when building new channels or storehouses in the harbour-area, trying to gain control over the trade with tea, wine and spices. The newly build harbour will be divided into several areas, and the players try to position their storehouses and cranes in positions which allow to become the most successful trader in that area. For each area in which a player takes control he may place a storage-administrator. The game ends when all the tiles for harbour-building have been used up, and then the players will receive victory points for their storage-administrators on the board. The game is won by the player with most victory-points. To offer an even more interesting game, rules for profi-play are also included. Now a ship of the Amsterdam Harbour Control will cruise on the channels, possibly preventing certain building operations. If a tile in the harbour bears a ship symbol, that tile may be removed if the ship should be positioned next to it. The only way to protect a tile from removing is by placing it away from a channel, thus preventing access for the Harbour Control. To round it up, the rules also include a number of scenarios, offering a lot of different games to play and win the game. 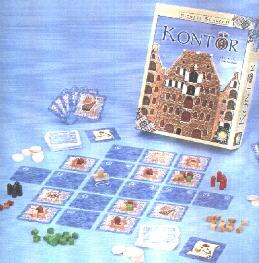 Some of the scenarios even allow 4-player-games, whereas the normal games of Kontor are only meant for 2 players. Actually Kontor is a quite good two-player-game, better suitable for only two players than most of the other Goldsieber-titles. The rules guarantee a very balanced play, and the included scenarios offer fun for a lot of games. Especially if played with the profi-rules, the game is quite attractive, since the players now have to be quite careful when trying to construct the harbour. By aid of the Harbour Control, the leading player still can be beaten at places where he normally wouldn´t expect this. Looking for this game? Visit Funagain Games!